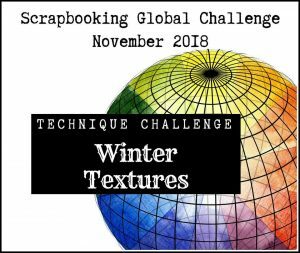 Welcome to another Scrapbooking Global Blog Hop. This month’s theme is Winter Techniques. In the UK we have a Christmas Jumper Day where everyone wears a Christmas Jumper and raises money for Save The Children charity. This year it is being held on Friday 14th December. I decided that I wanted to design a layout using the Cable Embossing Folder. As everyone knows Christmas jumpers are bold and bright, I decided to cut out a jumper from the reindeer patterned Under the Mistletoe Designer Series Paper. I then made a template and cut the smaller jumpers from Real Red card stock and even smaller jumps from Old Olive card stock. The Real Red jumpers were embossed using the Cable Embossing folder and the lines on the Old Olive jumpers were made using the Simply Scored Scoring Tool and the Simply Scored Metric Scoring Plate. 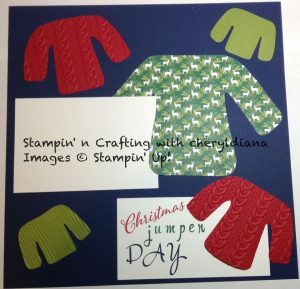 I stamped the title using the Christmas stamp from the Merry Christmas To All stamp set in Real Red ink. Then using the Brushwork Alphabet I stamped the words Jumper and Days in Old Olive ink and Night of Navy ink. Finally I have left space to mount the photo which will be taken on Friday 14th December. I hope you have enjoyed my simple layout. Please do leave comments as you hop around this month’s Blog Hop. To visit Marga and see her scrapbook layout please click on the Next button. WOW!!! What a cool layout <3 Very funky! !